Elvis Pyjamas Sold - Misc. A pair of mint-green pyjamas worn by Elvis Presley has sold at auction a UK auction this weekend for £8,000 ($10,400). 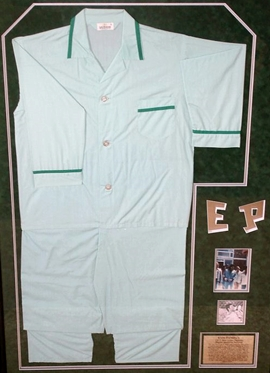 The "Lord Shannon" nightwear was worn by Elvis during a stay at the Baptist Memorial Hospital, Memphis, in 1977. Auctioneer Andrew Aldridge said: "He spent a week there recovering from exhaustion and they were left at his father's home." The Henry Aldridge & Son auction house in Wiltshire was asked to hold the sale after auctioning Elvis's shoes for £29,500 in 2015. After Elvis died in August 1977, aged 42, the pyjamas went on display at the world famous Elvis-A-Rama museum for many years. Also up for auction was Elvis' first music agency contract which sold for £37,000. It was signed on 31 January 1956, the day after the singer recorded Blue Suede Shoes. Mr Aldridge said: "There was significant interest in the auction from buyers all over the world especially from the US and UK both online and bidders on the phone. "The prices achieved reflect the continuing interest in the King of Rock and Roll." More interestingly was that a copy of 'The Omen' novel which contained one of Elvis last-ever autographs was withdrawn from the auction by its owner. The David Seltzer’s book, The Omen, a novelisation of the hit horror movie, was accompanied by an original file copy of a letter Elvis’ father wrote to a fan the following year.